Some people have the idea that memory is like a tape recorder: if you remember it, that’s the way it happened. But, the data show that our memories can change quite a bit over the course of time. We discuss these experiments and what it means for games. Jacoby, L. L., Kelley, C., Brown, J., & Jasechko, J. (1989). Becoming famous overnight: Limits on the ability to avoid unconscious influences of the past. Journal of Personality and Social Psychology, 56, 326-338. Loftus, E. F., & Palmer, J. C. (1974). Reconstruction of automobile destruction: An example of the interaction between language and memory. Journal of verbal learning and verbal behavior, 13(5), 585-589. Episode 14: Are You Available? There are a number of heuristics that people use when they make decisions. In this episode, we discuss the availability heuristic and how we use it when playing games. What might a cognitive psychologist say about game design? We discuss some of the issues Don Norman raised in his classic book The Design of Everyday Things and how that relates to game design, both from the player and the designer’s point of view. Lindsay, P. & Norman, D. A. (1972). Human information processing; An introduction to psychology. Academic Press, New York. Norman, D. (1988). The Design of Everyday Things. Basic Books, New York. Selinker, M. (2011). The Kobold Guide to Board Game Design. Open Design. This episode contains a deep dive into the cognitive ins and outs of the Playstation 4 game Horizon Zero Dawn. Much of the analysis, though, could be applied to most open-world games. We’ll consider narrative, skill transfer, and types of knowledge. Crossman, E. R. F. W. (1959) A theory of the acquisition of speed-skill. Ergonomics, 2, 153–166. Gunzelmann, G., & Anderson, J. R. (2006). Location matters: Why target location impacts performance in orientation tasks. Memory & Cognition, 34(1), 41-59. Newell, A. & Rosenbloom, P. S. (1981). Mechanisms of skill acquisition and the law of practice. In Anderson, J. R., editor, Cognitive skills and their acquisition, pages 1–55. Lawrence Erlbaum Associates, Hillsdale, NJ. Seijts, G. H., & Latham, G. P. (2001). The effect of distal learning, outcome, and proximal goals on a moderately complex task. Journal of Organizational Behavior, 22(3), 291-307. Hi all! Just wanted to give a quick update on Episode 09. This will include an interview with a special guest, and we’ve been at issues on scheduling! At the latest, we’ll get it done this weekend, so look for a new episode by early next week. Sorry for the wait (it will be worth it, though!). In the meantime, play some fun games! In the last few weeks we’ve acquired and played Sagrada, the Metagame, and 7 Wonders, all of which I would recommend! And, special shout-out to Ryan, who gifted me with a deck of Epic Card Game and a couple of other goodies he acquired at GenCon. Here’s a picture of the “gaming pile” on our dining room table. I’m trying to get the word out about the podcast. 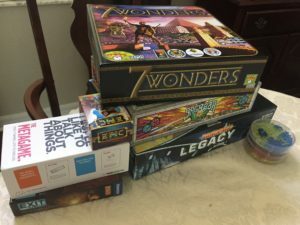 If you found this website via Boardgame Geek and my attempts there to get the word out better, welcome! I’m now seeing triple digits in some of the episodes! Woo hoo! I know what the next episode will be, one on problem solving. Then, either Episode 09 or Episode 10 will have a special guest it looks like. We are still working out the details. Thanks for being on this ride with me! I hope you are enjoying it!